The Toreador Motel consists of 25 ground floor units. 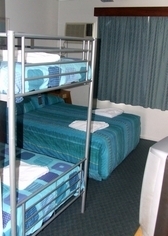 We are conveniently located for the traveller, one block from the city centre. Motel facilities include Free Wireless Broadband Access, Large pool with built in spa, RC Air conditioning, Austar (including Fox Sports and Free Movies), Room Service Breakfast available, Guest Laundry, Undercover parking. Each room has reverse cycle air conditioning, Austar movie & sports channels, En-suite bathroom, Room Service Breakfast, Secure undercover courtyard car parking, Refrigerator, Ceiling Fans, Rooms serviced daily, Coffee and tea making facilities, Hair Dryer, Non-smoking units. Each room has Reverse Cycle Air Conditioning, Austar movie & sports channels, En-suite bathroom, Room Service Breakfast, Secure undercover courtyard car parking, Refrigerator, Ceiling Fans, Rooms serviced daily, Coffee and tea making facilities, Hair Dryer, Direct dial telephones, Non-smoking units. Each room has Reverse Cycle Air Conditioning, Austar Television, En-suite, Room Service Breakfast, Secure undercover courtyard car parking, Refrigerator, Ceiling Fans, Rooms serviced daily, Coffee and tea making facilities, Hair Dryer, Non-smoking units. We offerfree Wireless internet broadband access and copying and fax facilities during office hours. Check in is any time after 2pm and Reception is open until 9pm. To organise arrival outside of these hours please contact the motel directly. We offer undercover, courtyard car parking. The courtyard is safe for cars and motorbikes as no one can walk through. A trailer parking bay is available on request. HIgh vehicles can also park off road. You can find us one block south of the Coffs Harbour CBD with the Tourist Information Centre and Interstate/Country Coach Terminal (bus stop) directly across the road. The motel is ideally situated right in the heart of beautiful Coffs Harbour, within walking distance to shops, restaurants and the very popular Ex-serviceman's Club. The Big Banana is nearby and the beaches are a 5 minute drive. Visiting the marine park, whale watching and pleasure scenic walking around the coastal strip and waterways is popular.